I’m going to let you in on a little firearms training secret. 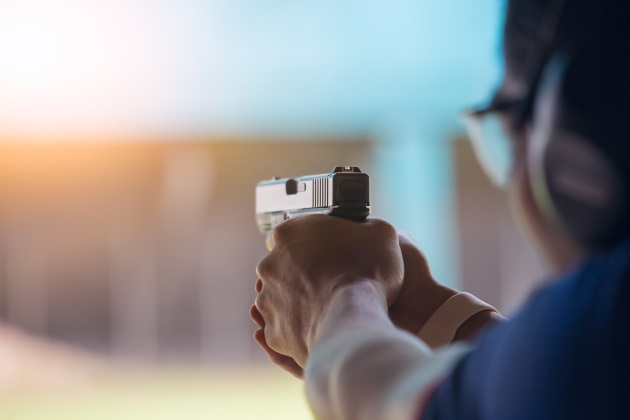 It’s a trick used by instructors to get shooters on target quickly when they’re having problems, but don’t have the time to work with every shooter on the line as much as they’d like. Roughly half of the shooters I work with keep using this trick for the rest of their lives. The problem is…this technique that works so well shooting paper is almost guaranteed to fail in a life-and-death shooting situation. It’s closing one eye while shooting. This will cause an immediate improvement in accuracy for about half of all shooters. But it creates big challenges down the road if they ever end up needing to shoot under stress. You see, under stress, it’s very hard to close one eye. Here’s the problem with shooting with both eyes open. It can be confusing trying to figure out whether to use the image from the right eye, the left eye, or a combination of both. Here’s a representation of what I see when I shoot with both eyes open. This isn’t "right" or "wrong." It’s just the reality of what I see. Some shooters see two targets, one front sight, and one rear sight. Others see two of everything or one of everything. Some people don’t see a shadow image at all, and other people see two images of equal intensity. So, instead of working with 10-20 shooters individually, trying to figure out how to help them, instructors just have them shut one eye. And it works…until it doesn’t. Because if you always shoot with one eye closed and your brain won’t let you close an eye in a life or death situation, you’re going to have to figure out how to do both-eyes-open shooting on the fly when the stakes are at their highest. That’s a great way to guarantee a suboptimal outcome. Fortunately, everyone can learn to shoot with both eyes open. Most people can start doing it very quickly. I make sure they’re warmed up because I don’t want the improvement to be because they shot cold the first time and warmed up the second. Then, I have them do a few minutes (usually just 3-5 minutes) of vision drills from the Tactical Vision Training course. Then I have them run the drill again. I tell them that some people shoot it better, some worse, and some the exact same. Neurology is different for everyone and not everyone responds immediately to every drill. But time after time with group after group, there’s an average improvement of 20 percent…even though they’re using the exact same gun and same technique. The only change is how quickly and accurately their brain is combining and interpreting visual input. The averages have held with shooters who have healthy eyes, bifocals, trifocals, transitions, monovision, astigmatism, and more. First, the next time you use up a roll of paper towels, I want you to save the center tube. Look at something in the distance (20 feet to 50 yards) and put the tube in front of your nondominant eye. Try to switch back and forth between which eye you’re using so that you’re switching from tunnel vision to seeing everything. If you need to, try partially closing one eye at a time until your brain prioritizes the other eye. You only need to do this for 1-2 minutes at a time, a few times a week. What this will do is help train the brain to use the eye that you want it to use instead of deciding on its own or combining images from both eyes. In addition to shooting better with both eyes open, you’ll learn how to see your sights quicker, your target clearer, and see threats in a wider field of view. As one student recently put it, the impact is life-changing.